Amplification for High-Resolution ADC—Thermocouples generate very low-voltage signals, usually measured in microvolts. To acquire these signals with a measurement device, you must amplify the thermocouple signal to measure it accurately with a standard 12-bit measurement device. Alternatively, you can use a measurement device with a high-resolution ADC. NI recommends a device with 16 bits of resolution and amplification capabilities or a device with 24 bits of resolution. Cold-Junction Compensation—Thermocouples require some form of temperature reference to compensate for unwanted parasitic thermocouples. 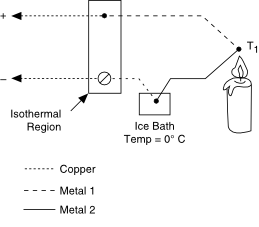 A parasitic thermocouple is created when you connect a thermocouple to an instrument. Because the terminals on the instrument are made of a different material than the thermocouple wire, voltage is created at the junctions, called cold junctions, which changes the voltage output by the actual thermocouple. Traditionally, the temperature reference was 0 °C. The National Institute of Standards and Technology (NIST) thermocouple reference tables are created using this setup. Although an ice bath reference is quite accurate, it is not always practical. A more practical approach is to measure the temperature of the reference junction with a direct-reading temperature sensor, such as a thermistor or an IC sensor, and then subtract the parasitic thermocouple thermoelectric contributions. This process is called cold-junction compensation. Filtering—A thermocouple can act much like an antenna, making it very susceptible to noise from nearby 50/60 Hz power sources. Therefore, apply a 2 Hz or 4 Hz lowpass filter to your thermocouple signal to remove power line noise. Linearization—The output voltage of a thermocouple is not linear with temperature. Therefore, your system must perform linearization either through hardware or software.